Pencils, paints and the thrill of a good tale are my inspiration. I gather these tales from dreams and my inner landscape, as well as finding them in books. Timeless stories and that most interesting of questions, "Why?" fascinate me, and the symbolism found in fairy and folk tales is especially intriguing. Making images is how I weave all the parts of my world together. I like to make paintings that feel personal, almost private, like reading a favorite book under blankets with a flashlight. Because stories are one of my favorite things, it is not surprising that my paintings look quite a bit like illustrations from a book. My work has appeared inside and on the covers of books and catalogs, and has been shown in many magazines, including Shaman's Drum, Magical Blend and Spirituality & Health. 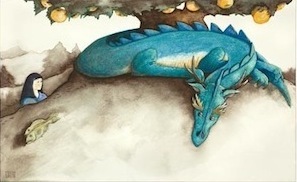 Two of my own illustrated story books, The Emperor's Pear Tree and The Teapot's Tale, are currently seeking publication. 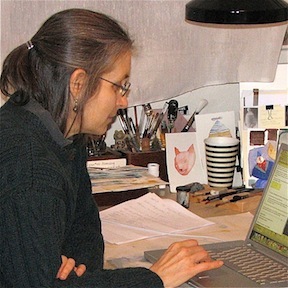 Painting and drawing happens most days in my tiny studio here in Northern California. Lizards, deer, blue jays, rabbits, very tall trees and the occasional mountain lion, bear and skunk are my neighbors. They remind me that my own small story is part of the much larger and immensely inscrutable Mystery of Life. Still curious? Find more tidbits about my work in the Interviews. All images © Susan Sorrell Hill ~ No copyrights are transferred or implied with the purchase of my original art or prints.